330 pages | 72 B/W Illus. This book presents a realistic perspective on the paradoxes employees face when navigating work and personal responsibilities for career success. The author answers the critical question of how to achieve sustainable and rewarding work–life integration from a perspective of "both/and" rather than "either/or." While most books focus on a fragmented, hyper-effective view of women and leadership, this book advances the need for an integrated approach. Its Competing Values Framework acts as an organizing model that aligns personal competency with organizational capability, helping readers to identify important leadership roles and competencies, break societal barriers, and choose the right set of behaviors to fit their personal and professional goals. 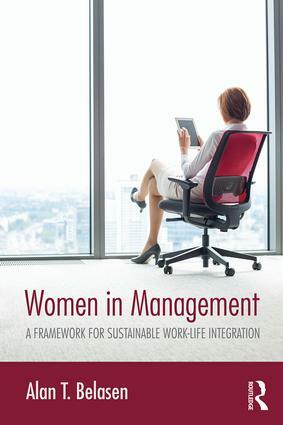 In-chapter text boxes provide personal insight from real employees both entering and established in leadership positions, offering a varied perspective on the challenges and resolutions available to women in management. As men become more engaged with their families, they too will find this book a useful tool. Students in diversity management, women and management, career development, leadership, and organizational behavior classes will benefit from this realistic and sustainable alternative to the "have it all" model. "In today’s world, women find themselves under tremendous pressure to perform with excellence in all life domains. For many, achieving work–life integration that is both enriching and rewarding is a highly challenging task. This excellent and important book tells the story of women worldwide and provides valuable information and research-based knowledge with the potential to improve the lives of millions of women who struggle with work–life conflict." "Belasen approaches work–life interrelationships for women from an integration rather than a balance perspective, using the competing values framework. In this 'both/and' approach, paradoxes are observed as potential sources of productive tensions rather than liabilities. Strategies for facilitating leadership development for women, as well as the business case for doing so, are compellingly presented." Alan T. Belasen is Professor and former Chair of the Graduate Business, Management and Leadership programs at SUNY Empire State College, USA. He is the co-editor of Confronting Corruption in Business, published by Routledge in 2015.